Members of the Association of Bermuda Insurers and Reinsurers [ABIR] made a direct economic contribution to Bermuda of nearly $900 million in 2016, according to the 12th annual member survey results published today by ABIR. Twenty-three ABIR members reported data for calendar year 2016. ABIR’s aggregate direct economic impact to the Bermuda economy was $886.4 million for CY 2016. This is up $52 million or 6% from 2015. ABIR notes the indirect impact of the operations of its major global commercial insurers and reinsurers is a multiple of that nearly billion-dollar figure. ABIR Chair Kevin O’Donnell — the CEO of Renaissance Re Holdings — said, “Bermuda remains a great place from which to run a global [re]insurance group. “Our market leadership continues to build on its strengths, including specialty sector expertise and the sophisticated, fit-for purpose regulatory oversight of the BMA. ABIR member employment grew in the last year, but Mr O’Donnell said, “Payroll tax changes can deter senior executive employment in Bermuda and we expect that any further payroll tax change will have a negative impact. The organisation said, “The year 2016 highlighted important “political risks” facing ABIR members as we witnessed both the UK referendum decision to leave the European Union [BREXIT] and the US elections resulting in a change in administration. “There were also increasing regulatory restrictions on reinsurance market access by other jurisdictions’ protectionist policies, coupled with changes in global tax-reporting and disclosure requirements led by the OECD and the EU. ABIR Travel and Entertainment Expenses in Bermuda: ABIR members estimated in 2016 they spent nearly $21.5 million in Bermuda on hotels, airfare, restaurants, taxis and catering; down 18% from 2015. ABIR Business Services Expenses in Bermuda: ABIR members estimated in 2016 they spent $72.1 million in Bermuda on legal, accounting, actuarial, temporary services and other consulting services; up 12% year over year. ABIR Member Charitable Giving in Bermuda: ABIR members estimated they contributed $7.5 million in 2016 to Bermuda based charities; down 8% from 2015. The decline in charitable giving coincides with membership consolidation. ABIR Member Construction, Real Estate and Housing Costs: ABIR members estimated they spent in 2016 $95.7 million on construction, real estate, housing, and office space in Bermuda; fairly flat over 2015’s $96 million. ABIR Member Bermuda Employment: ABIR members reported employing 1,621 full time staff members in Bermuda in 2016, up 87 people from 2015. Of the 2016 full time employees reported, 1,090 are Bermudian. This is up 58 from the number reported in 2015. The term “Bermudian” includes: Bermudians, spouses of Bermudians, and permanent residence certificate holders [PRC’s]. ABIR members reported 356 employees in underwriting roles in calendar year 2016, compared to 344 in 2015. 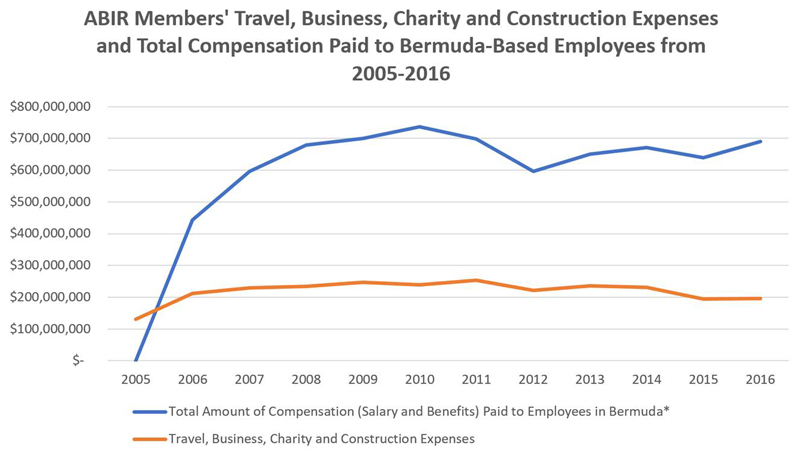 ABIR members reported the total salary and benefits/compensation for employees in Bermuda was $689.7 million, up 8% over 2015. ABIR Member Internships and Graduate Training Programs: ABIR members had 57 intern jobs in Bermuda in 2016. Seven ABIR members had graduate training programs for Bermudian employees in 2016. Members reported other training and development opportunities available such as tuition reimbursement and leadership training. ABIR Member Non-Bermuda Regulatory Domiciles: All ABIR members have licensed operating companies in Bermuda; and more than 70% of the membership has their ultimate holding company in Bermuda. In addition, the top five non-Bermuda locations for ABIR member operating entities were: United Kingdom, United States, Switzerland, Ireland and Singapore. But the International Business sector takes money away for Bermudians. They are using us for their gains and give nothing back. You mean they don’t pay taxes, pump money into our economy, provide jobs, grant millions of dollars in scholarships? And exactly how does IB take money from you? “Give nothing back”; What in the heck are you talking about? did you READ the article? Not to mention common bloody sense! This anti-immigration bs or zenophobia is EXACTly why countries end up like Jamaica. Cash injection is Cash injection no matter whom it comes from we all benefit. USE your BLOODY head!Yes expats get more benefits.. but they also spend more. That cafe worker..their tips are from International business workers pockets. That laundromat that’s being built, their loan has cheaper interest rates because of the subsidies earned from International business by banks. USE YOUR BRAIN and don’t drink the cool-aid! Give nothing back? Wow..try really thinking for yourself and justify that comment. Warning shot to the government to not mess with IB’s money. And the government should listen. Taxing more hasn’t worked for any country. Attract new businesses and build new economies. Train the local labor force so that they can replace expats as work permit terms end. That is the only way forward. $900M per annum contribution. That is a huge injection into our economy I hope we all understand the importance of our international businesses and the people they employ. The spending that goes on reaches every facet of our economy. Ya, we should just tell them to leave because we would be much better off without that silly $900m. Same for the AC35….we could have done much better without that waste of time event. Will never benefit from that. In case your ignorance prevents you from understanding…the above is sarcasm. If you can’t see the benefits of having these companies here when the value is presented as such in the article above, nothing anyone can say will help.